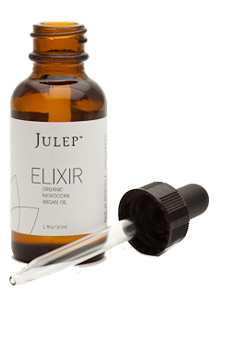 This is the first month ever for Julep Maven. In this box we got the Glycolic Hand Scrub, either the base coat or nail therapy depending on how we answered our survey, and two colours. For people who signed up for this later on they did not get the base coat! This was the first official box. It was the first preview email we got, the first time we could shelf pull, and it was the introduction of the cuticle oil to mavens (I had a bottle of this from the year before but it was in a round plastic bottle. This was the introduction of the new bottle (a roller ball top on the normal glass polish bottle). It was also where everyone got to try the SPF hand cream. And yes, we all noticed that Stella was shown even though it said we were getting Stefani! I honestly don't remember which one we got!! LOL! October was the month I was most anxious for ever. 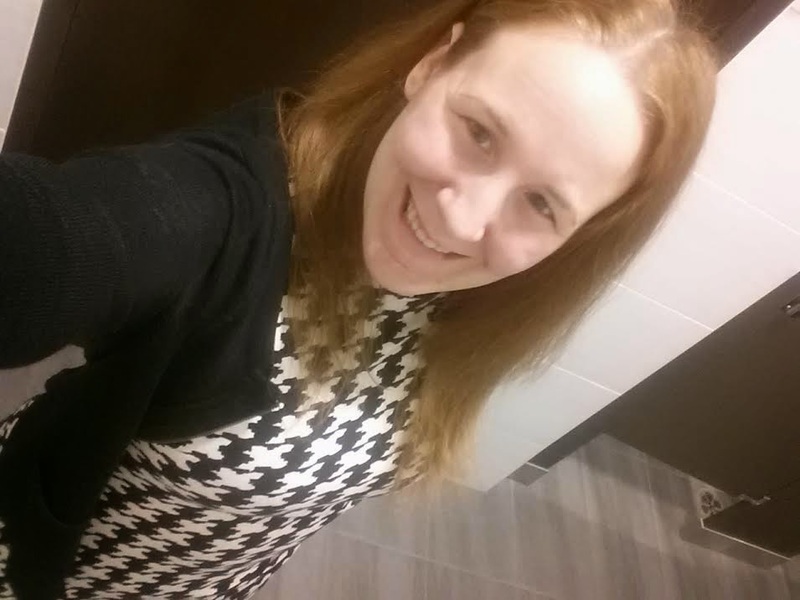 Gayle (a woman I love so much!) had the honour of having a polish named after her. And man oh man did I want it. This month could not have come soon enough!! I needed my GAYLE!! taken from the alapeach.com website! 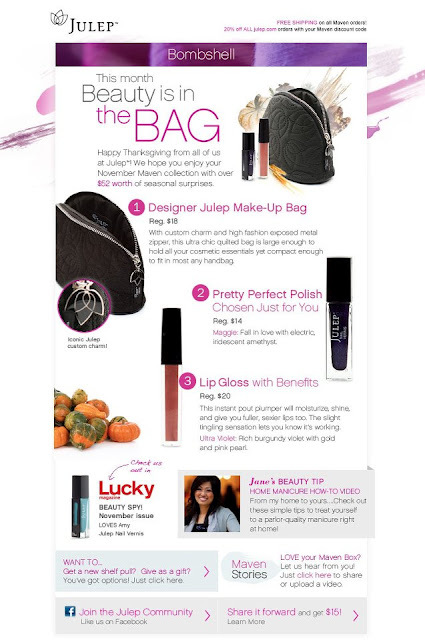 Beauty was in the bag this November. Introducing not only the new makeup bag, but also the plumping the lipglosses, this month caused a bit of a stir. Seems a lot of people were upset that they were only getting ONE polish. There was so much of an outcry that they ended up making an EXTRA option this month, being the polish lovers box. 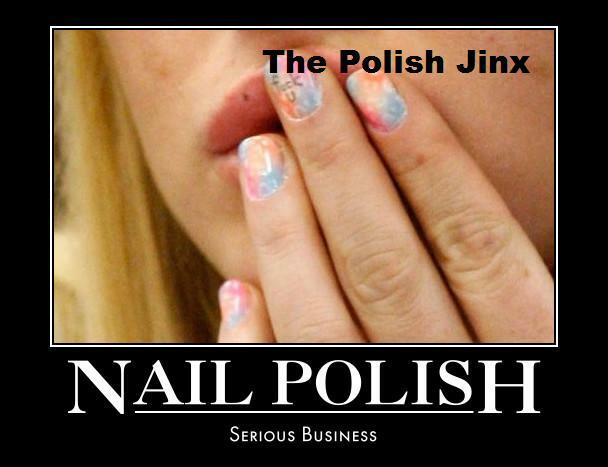 From next month on the it girl box will be the polish lovers box. December was an interesting month. We were all expecting a very festive holiday box and I am not sure that was what this was. 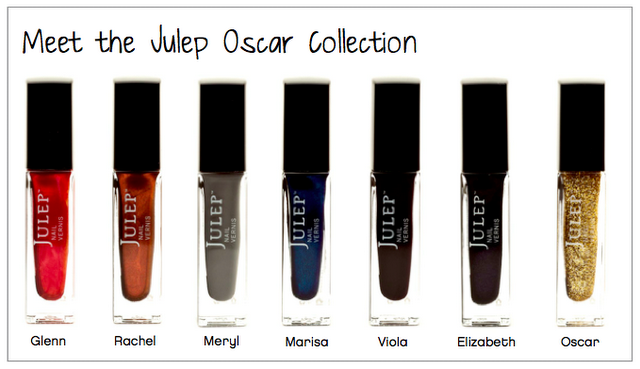 We did get to try the new Julep Nail Appliques, and the new pomegranate scrub. 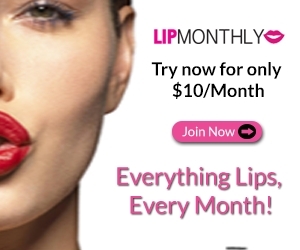 It was also the first month of the new "it girl" box. 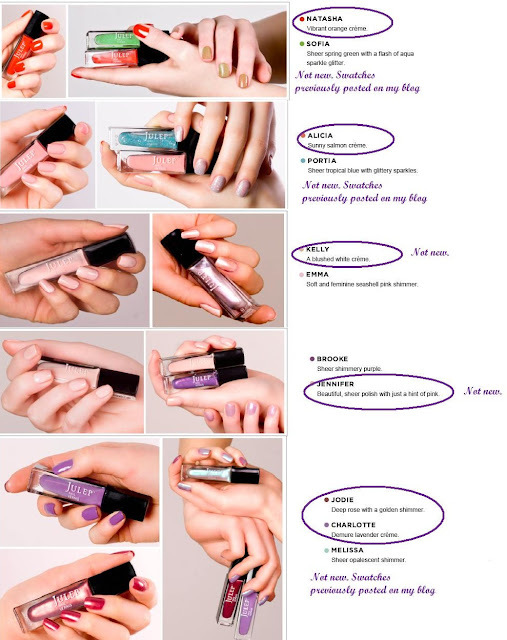 Before the boxes were all separated by theme, but from this box on, there is always going to be a polish only (no products that don't go right on the nail) known as the It Girl box. This month was the resort collection! Talk about tropical! Megan may still be one of my favourite Julep colours. I even had to by an extra one for my little cousin since her name is Megan after all! If some of you are wondering what this months mascara had to do with a nail salon, you wont even begin to comprehend the hair products this month. Not sure I love it, but it sure smells FABULOUS!!! And the theme, Oscars was sure on the mark time wise. And the chocolate Oscar everyone got was enjoyed by most! This month seemed to me the most DIFFERENT and unique of the Julep polishes thus far. It contained a bunch of sheer polishes meant to be used as top coats! 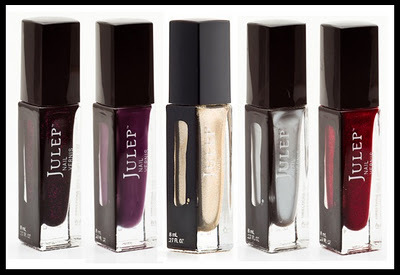 Express yourself collection was a mix of new and previously released polishes! Another new product we mavens get to preview first this month is the 100% pure Organic Moroccan Oil. I really need to stop forgetting about this and start using it!!! April 2012 was all about the feet. Spring and Summer pastel brights along with a wonderful Pedi Cream! 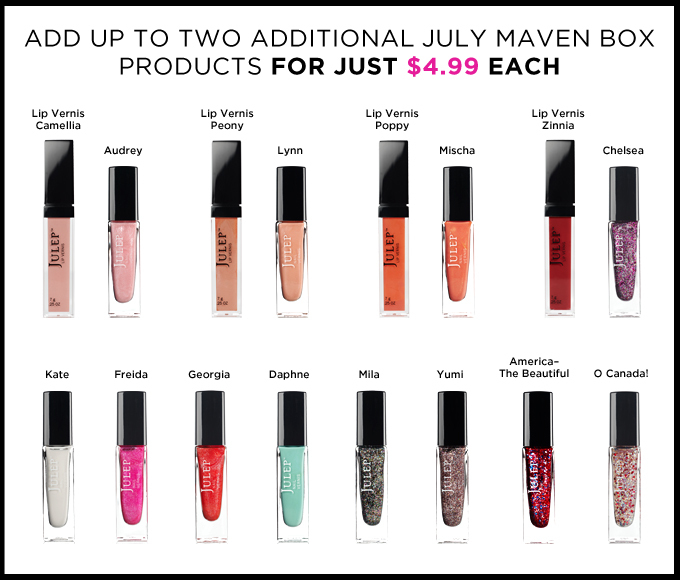 This month they also offer a new option where you have the choice to add on up to two additional products to your box for a discounted price. April may have had the pedi cream, but MAY is the month that really is about the pedicures. The pedi prep (removes calluses) and foot soak are perfect to prep your feet before the pedi cream and the added foot file was the tool to tie it all together!! June was all about brights! Just like April. You really knew it was summer when you saw these colours!! They also introduce a new sunscreen! I never tried it, did you? July was a festive month. With both Independence Day AND Canada Day everyone gets a bonus polish this month in ADDITION to the normal box!! Also, the infamous Yumi (a Sephora exclusive colour up until this point) is finally available outside of Sephora! 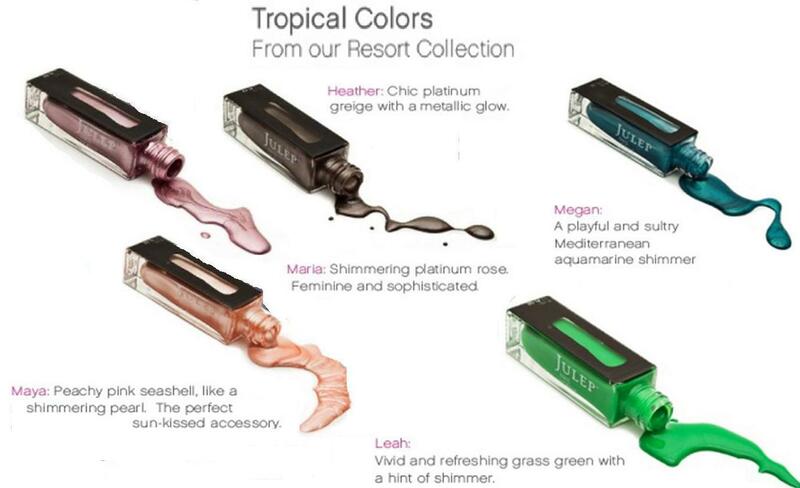 This was the Metallics & Chromes collection! For me the stand out product this month was the nail polish remover. Very expensive for the amount you get, but it is the first acetone free polish remover that actually works well and doesnt make me want to rip my hair out!! 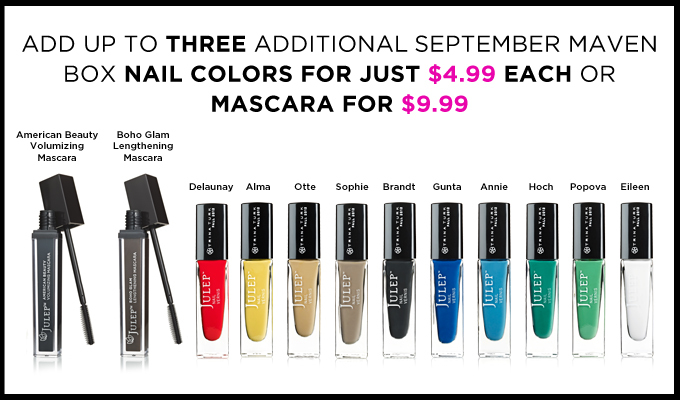 It is also the first month where the add on option has been upped from two polishes to three. Could it be???????????? The Suedes? 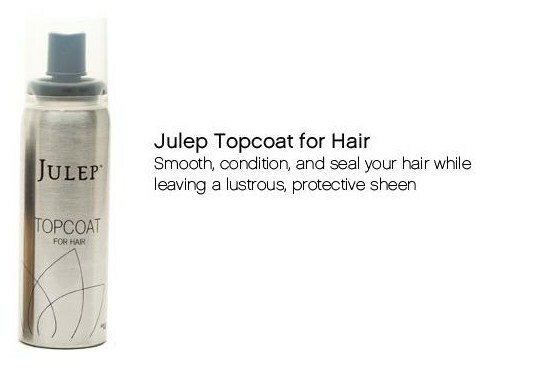 I feel sorry for Julep if its not for all the abuse they will take!! EEK!! I guess I'm going to have to! I can't believe another 8 months have gone by! I'm pushing this off until the end of the year though! a year later, I am going to do that THIS week!